the form when ordering. Your bracelet will be custom made for you and in the mail within seven days. Click on the photo to see the bracelet super-sized. 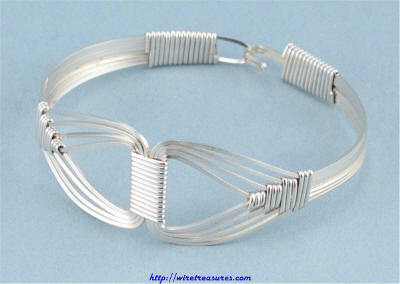 This Sterling Silver wire bangle has a flashy yet classy geometric design. You'll love the way it looks on you! This is a Debbie Penrock design with modifications by Jessie Donnan. Wrapped in Sterling Silver wire. If you have questions about this bracelet, please and I'll respond as quickly as I can! You are visitor number 6,566 to this page.